More than 2 trillion VND (US$86.2 million), or 40-50 percent of the budget of the southernmost province of Ca Mau, is contributed by the Ca Mau Gas-Power-Fertiliser Complex each year, a recent meeting heard. The Ca Mau Gas-Power-Fertiliser Complex, inaugurated in October 2012, is jointly operated by the PetroVietnam Gas JSC (PV Gas), the PetroVietnam Power Corporation, and the PetroVietnam Ca Mau Fertiliser JSC. It is comprised of three projects covering more than 200ha in the Khanh An commune of U Minh district. The first project is the PM3-Ca Mau gas pipeline carrying gas from the PM3-CAA gas well (in the overlapping area between Vietnam and Malaysia in the Gulf of Thailand) and Block 46-Cai Nuoc (off the coast of Vietnam) to the complex to produce electricity and fertiliser. The other projects are the Ca Mau No. 1 and 2 gas power plants with a combined capacity of 1,500MW, and the Ca Mau fertiliser plant with the designed output of 800,000 tonnes per year. 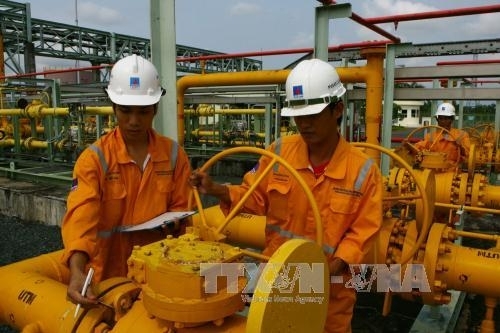 A report at the meeting, which reviewed the coordination in operating the complex, said that the PM3-Ca Mau pipeline, put into use by PV Gas in 2007, has supplied about 2 billion cubic meters of gas each year. The two gas power plants have generated over 7 percent of the electricity output nationwide. Meanwhile, 40 percent of total urea output in Vietnam is produced by the fertiliser factory of the complex. A gas processing plant has also been unveiled in the complex this year. In the first six months of 2018, it manufactured nearly 79,000 tonnes of liquefied petroleum gas and over 3,600 tonnes of condensate, up 42 percent and 15 percent from the planned figures, respectively. At the meeting, participants pointed out problems and solutions to ensure smoother operation at the Ca Mau Gas-Power-Fertiliser Complex. Dinh Van Son from the member council of PetroVietnam (Vietnam National Oil and Gas Group), said amid the changing global economy, good coordination among parties in operating the Ca Mau Gas-Power-Fertiliser Complex will help the group successfully fulfil the tasks assigned by the Party, State, and Government.